Citizens groups should have just enough structure to address their goals. In an attempt to become legitimate, many small groups decide they need more structure. Unfortunately, this can lead to spending more time on the needs of the organization than on the reason for getting together. Grassroots organizations seem to work better with a flat structure as free as possible of boards, directors, and chairs. Flatness, or the absence of an organizational hierarchy, does not mean the elimination of individual roles or responsibilities. It does mean the end of people with over-riding authority over other people's work. 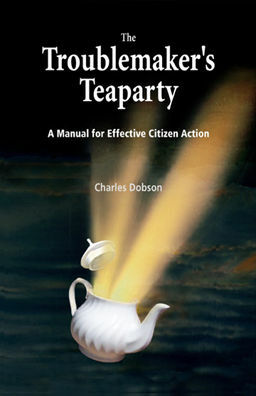 Citizen's groups must avoid the common mistake of involving small numbers of people heavily. They should strive to involve large numbers of people lightly. Flat organizations, which emphasize horizontal connections, seem to be best for involving large numbers of people lightly. The tricky part is making sure they don't drift away. Some groups elect a set of officers - a president, one or two vice presidents, a secretary and a treasurer. In order to include people doing important work, some expand the leadership group into a steering committee that includes the chairperson of each committee. Leaders should be elected on a regular basis at well-publicized membership meetings. One or two people should not try to run the organization. When that happens others become less involved. Working relationships with power players and resource organizations. Power players are people with the ability to make things happen: politicians, owners of key businesses, media people, heads of key government departments, heads of agencies, major landlords. Traditional organizations frequently wind up as registered non-profit societies. The advantages of non-profit status are few, beyond less circuitous access to certain sources of funds. On the other hand, non-profit status means having to follow the rules and organizational structure required by legislation covering societies. If you wish to become a non-profit regardless, get an up-to-date diy guide to forming a non-profit in your state or province. Committees and task forces are the main way jobs are shared. They make it possible to get a lot done without anyone getting worn out. Standing committees look after a continuing group function; task forces carry out a specific task, then disband. Both provide members with a way of getting involved in projects that interest them. A large, action-oriented group might have the following standing committees: coordinating, publicity, membership, outreach, newsletter, fundraising, and research. Many people prefer the short-term projects of task forces, to the work of committees. Ideally, members of committees and task forces are made up of people selected by the whole group rather than by people who are self-selected. If the whole group is confident in a task force or committee it should empower the subgroup to make most decisions on its own. To keep everyone working together, committees and task forces should regularly report back to the whole group. If you intend to tackle a large issue you will need allies. Approach other organizations by asking to speak on a matter of community importance at their next executive or general meeting. After you have presented, distribute material outlining your objectives, program and budget. A good way of getting agreement is to ask someone from the group you are approaching to help prepare your presentation. A coalition requires that all participants have a clear set of expectations and get together regularly to develop a friendly working relationship. A coalition works best when established for a specific project, and then allowed to lapse when the project ends. Because coalitions can be tricky you might check out the advice in the latest edition of the Midwest Academy's book Organizing for Social Change.